We are pleased to bring you two new services which will help guard your debit card against fraud. Shazam Bolt$ - download the free mobile app on the Apple App Store or Google Play. Falcon Fraud - identifies possible fraud transactions on your debit card. Shazam will contact you by phone if they detect suspicious transactions. Shazam's phone number is 866-508-2593. 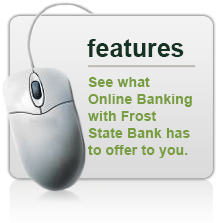 While online banking is safe, as a general rule, you should always be careful about giving out your personal financial information over the internet. 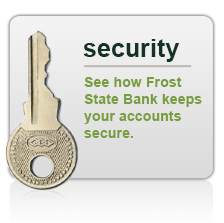 Frost State Bank will NEVER send you an email requesting confidential information. We also will not send you an email re-directing you to another website to log in.